I had a friend over for tea tonight. He brought his brother along with him. 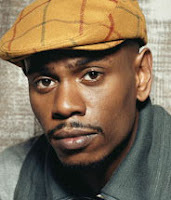 I'd met his brother once before, but this time I was struck by a resemblance to Dave Chappelle. I took a picture to put alongside a picture of Dave Chappelle, but the resemblance wasn't quite as strong in the photo as it was in person. But I thought you guys might enjoy it. Oh, after a staggering one vote in the book selection, I decided to read "The Blood of Abraham" by Jimmy Carter. One more vote came in after I'd started reading. Sorry Eddy & Jess . . .